Plane Jane is back with another proper 2-sider. 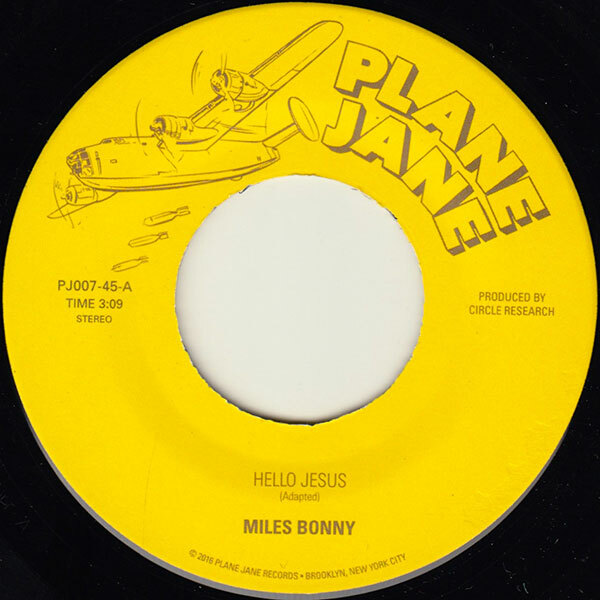 This time by way of Miles Bonny, we heard Hello Jesus a few years back on an EP Miles had put out and Lepse has been playing it to dancefloors ever since. The tune gets such a heavy response we wanted to get it on a 7, so here it is. Side A is Bonny’s version of a song that isn’t called Hello Jesus, with production by Canadian duo Circle Research. The bass and drums alone catch you from the first beat, add the gritty synth lines and Miles’ smooth but rough vocals and we have a hit. Sure to set the dance on fire for all the DJs that play this kind of thing. Side B find Bonny’s version of a song that is not called High Enough, again with the strong production lead by punchy drums and a very recognizable bassline. Another Plane Jane classic sure to be getting heavy play across the world.